An important milestone in the evolution of any new format is the introduction of a product by a company other than the developer. It signifies that someone else, besides the originating company, has confidence in the new technology. The more partners, the better the chances for success, but the first is always the most important. The original Sony MiniDisc products have now been joined by two portable MD players from Sharp that define what MD is all about—small size. Specifically, the MD-D10 reviewed here is only about one-half to two-thirds the size of a typical portable CD player (though at 11.6 ounces it weighs only slightly less than many CD portables). The MD-D10’s disc-loading system is unlike the powered loading slot used in the Sony MD portables or the direct disc placement used in CD portables, and in fact is akin to a typical cassette loading mechanism. The MD-D10’s upper case forms a clamshell that rises slightly when you press a mechanical release button. Then you can grasp the shell and raise it about a half-inch so that you can slip in an MD before closing it again. When you release the shell to retrieve an MD, the shell opens slightly, you raise it further by grasping it, and the disc is nudged forward by an internal spring. The top shell contains seven controls. The play/play-mode selector button initiates playback and engages disc repeat and random track play back. The off button stops playback and turns the unit off; if left in the stop mode for more than 5 minutes, the player turns itself off automatically. Forward and backward skip/search buttons move the laser pickup from track to track when tapped and engage audible fast search when held down. The X-Bass/NC button changes the frequency response of the audio out put signal. The X-Bass setting effectively provides a slight bass boost (actually by slightly cutting middle frequencies), whereas the NC (Noise Control) setting reduces audible sound leakage from headphones, which may annoy other people, by dramatically cutting high frequencies (a 9-dB reduction at 7 kHz). The display button is used to view disc and track titles as well as total disc time and elapsed track time. A slide switch marked Hold is used to disable the other buttons to prevent accidental changes. Unlike many CD portables with similar features, the MD-D10 does not flash HOLD on its display when you try to use locked buttons— that would be a nice enhancement. Button-pushing is confirmed by a beep tone in the audio output; fortunately, you can defeat the tone by holding down the X-Bass/NC button. The player’s dot-matrix LCD can show as many as ten alphanumeric characters on one line. It flashes a POWER ON message when the play but ton is first pushed, then the track title scrolls across the display, followed by the elapsed track time. The track number is displayed simultaneously below the scrolling messages. This display sequence is repeated each time a new track is selected. When the stop but ton is pressed, the player displays the disc title, followed by the total number of tracks and total disc time. When the stop button is pressed again, a POWER OFF message comes up briefly. Other LCD indicators include symbols and labels for play, repeat play, random play, Noise Control, X-Bass, and low battery, as well as diagnostic messages for troubleshooting. The display contrast can be varied to suit lighting conditions. There is a volume-control knob on the right side of the player and a mini- jack output on the back, which can be used both for headphone listening and for connecting the player to an external stereo system. The left side of the player holds a DC-power input jack. Underneath is a door to a compartment holding a rechargeable nickel- cadmium battery. A 6-volt AC adaptor/battery charger is supplied; although there is no charging-status display on the MD-D10 itself, a small red LED on the wall-plug module lights while the player’s battery is charging and goes out when charging is completed. Charging takes about 5 hours, and the battery can be recharged approximately 500 times. Using a fully charged battery, maxi mum playback time is about 100 minutes for prerecorded MD’s and about 90 minutes for user-recorded MD’s. (That’s one characteristic I definitely think needs improvement: Listening to one 74-minute user-recorded disc pretty much kills your battery.) Also included with the MD-D10 is a pair of inexpensive but serviceable headphones, a plastic carrying pouch, and an adaptor cable for connecting the MD-D10’s mini-jack output to phono jack inputs. The MD-D10’s dramatically diminutive size (much smaller than earlier MD players) is made possible by a trio of new Sharp-developed chips that consolidate a lot of the necessary circuitry and reduce power consumption. Like other MD players, the MD-D10 has an anti-shock buffer memory—in this case, a 1-megabit chip that holds 3.1 seconds of audio data—to help prevent vibration from disrupting playback. Following ATRAC decoding, the digital data stream is converted to analog audio by a 1-bit D/A converter. Lab tests revealed no apparent weaknesses in audio performance. Frequency response, signal-to-noise ratio (S/N), dynamic range, distortion, and low-level linearity were all good to excellent. The only audio products we’ve encountered that rival this performance in such a small package are portable CD-3 (3-inch CD) players, which, like the discs themselves, are rare in this country. All measurements were made with the player powered by a fully charged NiCd battery. But with any system based on perceptual coding—ATRAC in the case of MD—traditional measurements tell only part of the story; the sound quality of a perceptual coder cannot be estimated directly from such tests. The best way to evaluate sound quality is to listen carefully. I auditioned the MD-D10 both with headphones and over a high-end sound system. 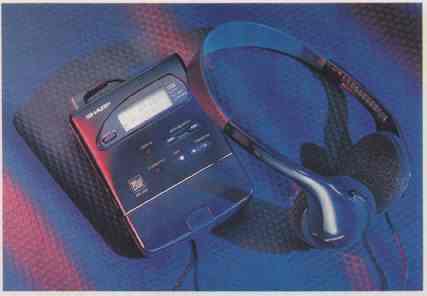 Using the supplied headphones, I was quite satisfied with the sound quality, which to my ears was essentially indistinguishable from that of portable CD players with their headphones. In other words, I suspect the limiting factors in each case were the headphones and the internal amplifiers. When I played the MD-D10 in a high-quality home audio system, how ever, in which fidelity is much higher and direct A/B comparisons between CD and MD are possible, I could hear slight differences between the two. It’s hard to describe, and certainly not immediately obvious, but in the MD playback the imaging was altered, with shifts of high-frequency sources, and high-frequency timbre was altered as well, with a blurring and hardening of the sound, particularly in transient material. The MD-D10’s sound was not bad—not bad at all, in fact—but for now an MD simply ain’t no CD. Perhaps more important, any portable product must be evaluated on its portability. I therefore conducted my own highly scientific vibration test, in which I put on shorts and run around the block carrying the player. No CD or MD player that I have evaluated in the past has ever successfully completed this jog test. But after consider able exertion I decided to give the MD D10 a passing grade. Although it muted momentarily a few times, it was decidedly capable of shrugging off shock and vibration. Given that this player uses only a 1-megabit buffer (about 3 seconds) and that a 4-megabit buffer (about 12 seconds) could easily be designed into future models, I am confident that MD will eventually achieve full joggable status. While playing the MD-D10, I made certain that it handled both 60- and 74- minute user-recorded discs as well as prerecorded discs (no problem). I was also happy to note its speedy track access—not as fast as the fastest CD players I’ve seen, but very fast. On the other hand, the LCD message scrolling was too slow (even small children, just learning to read, would become impatient). It was so slow that I rarely waited around to read it, and that effectively defeats its purpose. Buying an MD player ultimately comes down to two questions: portability and repertory. The MD-D10 measures 3 x 4 x 1 inches, weighs 11.6 ounces, and plays for 100 minutes. A portable CD player—the Technics SL-XPS900, for example— might measure 5 x 5 x 11/16 inches, weigh 12.2 ounces, and play for 2½ hours (10 hours with supplementary battery pack). The MD wins on size, the CD wins on playing time, and they tie on weight (depending on how many batteries you’re toting). The difference, of course, is the MD’s superior shock resistance (although some portable CD players now incorporate similar shock-proofing systems). Repertory is another tough call. Many thousands of CD titles are now avail able, whereas MD is exactly where CD was in the beginning—about 300 titles. Of course, you can record your own MD’s, but the blank discs cost as much as prerecorded CD’s (or more), and you’ll have to invest in an MD recorder. Bottom line: If you intend to use your player in a very active environment (such as jogging) and are con tent with the selection of prerecorded MD’s, then the MD-D10 meets your needs. Otherwise, you can’t ignore CD. And, despite inferior sound, you can’t ignore analog cassette either— very cheap and a vast repertory. Whatever your decision, it is evident that the MD format is gaining a foothold in the market. With recorders from Sony and players such as the Sharp MD-D10, the MD choices, applications, and price range are expanding. In particular, if you want to be amazed by big-time sound from a small-time portable package, the MD-D10 is ready to run with you.